Thirty-nine year old George Selman, a Principal Prison Officer II, of Lot 10 Den Amstel West Coast Demerara wad Monday remanded for assaulting a police officer. 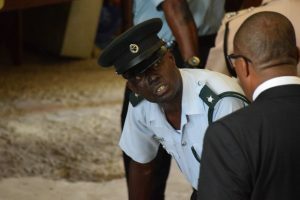 Selman stood before Magistrate Leron Daly in the Georgetown Magistrates’ Court and denied the charge that alleged on October 7 at the Camp Street Prison he assaulted a peace officer. The prosecution objected to bail based on the fact that Selman was previously arrested and charged for a similar offence and also convicted for another. Taking this into consideration those facts, Magistrate Daly remanded Selman until November 6.